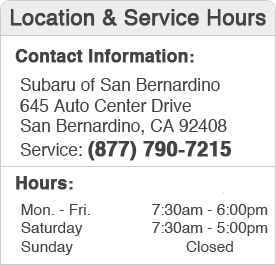 At Subaru of San Bernardino, we understand the importance of the investment you have made with your vehicle purchase. Our San Bernardino car repair center is here to help you to protect that investment. With regular factory-recommended maintenance, dealership's department for Subaru auto repair in San Bernardino can help you to keep your vehicle in like-new condition. Our friendly service staff and high-tech service facility set us apart from other lesser quality centers for car repair in San Bernardino. Make an online service appointment or give us a call to schedule your maintenance or car repair at our on-site shop on 645 Auto Center Dr, San Bernardino CA 92408. We look forward to serving you!